The music-drenched film stars Ansel Elgort as Atlanta’s best getaway driver and Kevin Spacey as the crime boss who won’t let him go. Rating: 3.5 stars out of 4. 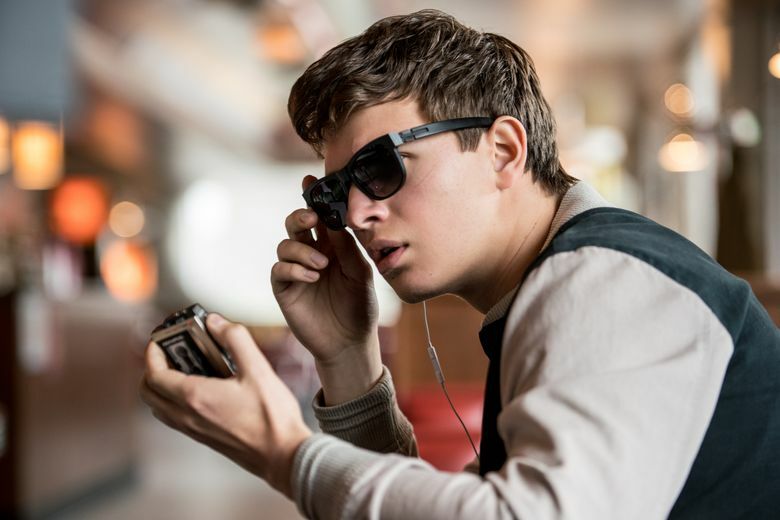 Yes, that catchy Simon & Garfunkel song “Baby Driver” comes into play during Edgar Wright’s zippy thrill ride of a movie; no, it will not easily leave your head (I’ve been humming it for a week); and yes, the movie’s just what you want a summer movie to be. “Baby Driver” isn’t a musical (though I’m having a blast at my desk imagining it as one, particularly Jon Hamm singing a bad-boy ballad), but it’s a movie drenched in music. Its hero, Baby (the perfectly baby-faced Ansel Elgort, from “The Fault in Our Stars”), lives his life with a perpetual soundtrack playing through earbuds, to drown out chronic tinnitus. He’s a getaway driver by trade, and he drives like he’s conducting a very fast symphony. Behind the wheel, he disappears into his music; out of the car, even more so: fingers tapping imaginary piano keys, body pretzel-twisting to the rhythm. And the movie dances, too: It’s uncannily choreographed, with gestures and movements timed precisely to the soundtrack’s beat. The story’s one you’ve heard many times: the old One Last Heist chorus. Baby, who has the misfortune of owing money to a crime boss known as Doc (Kevin Spacey), has developed a reputation as the best bank-robbery driver in Atlanta, and regularly ferries Doc’s crew — Buddy (Hamm), Darling (Eiza Gonzalez) and Bats (Jamie Foxx) — on jobs. After finally paying off his debts, he thinks about a different kind of life with sweet diner waitress Debora (Lily James), whose smile is like a happy song. Doc, however, has another plan in mind, and gunfire rains down in the movie’s third act. ‘‘Baby Driver,” with Ansel Elgort, Kevin Spacey, Lily James, Jon Bernthal, Eiza Gonzalez, Jon Hamm, Jamie Foxx. Written and directed by Edgar Wright. 113 minutes. Rated R for violence and language throughout. Opens Wednesday, June 28, at several theaters. But you’re not watching “Baby Driver” for the story; you’re watching to see the relish with which the cast dives into Wright’s pool (just listen to what Spacey, in his usual robo-evil fashion, can do with the line “I just drew a whole goddamn map in chalk”) and the way the film marries sight and sound. A laundromat becomes Technicolor poetry with a row of dryers tumbling primary colors; a trio of lollipop-red sedans becomes a speeding shell game set to music; a camera whirls like a dance partner around Baby and Debora at a restaurant table, as she idly twirls a finger around the rim of a wineglass — producing an eerie hum. And, in a climactic chase scene late in the film, Baby abandons his car and just runs — you realize, breathless, that you think he can probably fly. This movie has long been a passion project for Wright (“Shaun of the Dead,” “Hot Fuzz,” “Scott Pilgrim vs. the World,” “At World’s End”) and you can see that dizzy, heady obsession in every frame. Plus there’s a wonderfully random celebrity cameo (watch for a character called The Butcher) and a perfect “Monsters Inc.” ref. “Baby Driver” should steal a good chunk of this summer’s box office, and deservedly so.